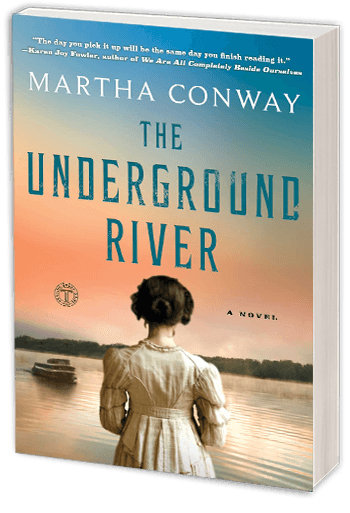 It’s 1838, and May Bedloe works as a costume designer for her cousin, the famous actress Comfort Vertue—until their steamboat sinks on the Ohio River. Though they both survive, both must find new employment. Comfort is hired to give lectures by noted abolitionist, Flora Howard, and May finds work on a small flatboat, Hugo and Helena’s Floating Theatre, as it cruises the border between the northern states and the southern slave-holding states. May becomes indispensable to Hugo and his troupe, and all goes well until she sees her cousin again. Comfort and Mrs. Howard are also traveling down the Ohio River, speaking out against slavery at the many riverside towns. May owes Mrs. Howard a debt she cannot repay, and Mrs. Howard uses the opportunity to enlist May in dangerous work. Lying has never come easily to May, but now she is compelled to break the law, deceive all her new-found friends, and deflect the rising suspicions of a Slave Hunter who captures runaways and sells them back to their southern masters.